At its core, this game is super simple, and outside of its core, it still is. You’re a lander, a little ship that’s built for landing on planetary bodies. That’s all you do, you land on planets. 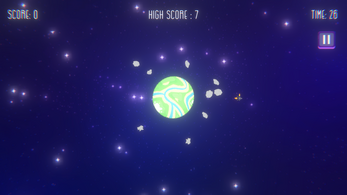 Asteroids, ship debris, and other obstacles will start spawning in with increased frequency. The planets will start to rotate at faster speeds, or with variable changes. Planets will start to gain hazards of their own, like lava lakes or elevation changes and slopes. And potentially more to come. The lander will be controlled with a vertical thrust and left and right thrusts. The entire game will be set in a minimalistic style. Possibly pixel art, but we are open to changes. And honestly, that’s about it. It will be a fun little mobile game. Beat your score while you sit down and play a few rounds. It’s like a refreshing snack, not a full course meal. Currently in development by a five person team. or install the .apk on your Android device and play it! I would recommend starting the countdown timer much sooner. I understand the intention with the countdown timer, but you are able to just stay above the start zone for as long as you like until you find the perfect route to take. This takes away from the point of the timer in my opinion. Having the timer start as soon as you start the next level would make it so you are actually being pressured by the timer. You could balance it out by starting at 40 or 45 if need be. But that leads onto my next point, the difficulty. The game is very lacking of any difficulty. 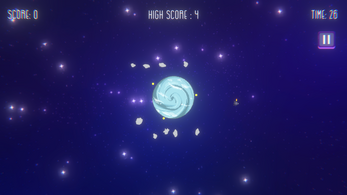 The planets don't appear to rotate much faster and you are able to complete levels in around four seconds (I played to wave 70 so it's based off of that.) I would recommend adding new obstacles that you must pass such as some sort of slowdown that will cause you to slowly get through it will the asteroids around you continue onto their original course, some sort of spaceship that will fire lasers at you a few times, or something simple like lasers! I would also recommend lowering the timer to 15 seconds for the first x amount of waves. 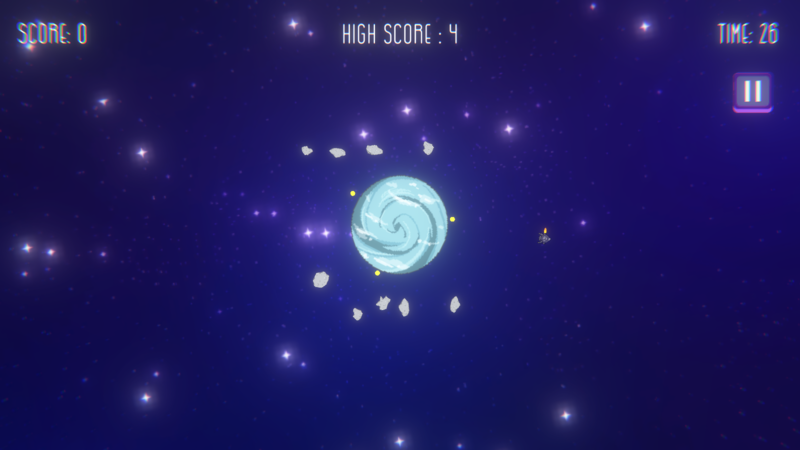 Another option is adding in some sort of stationary obstacles that rather stay stationary the whole time or follow the planets rotation (such as the volcano.) Going off the volcano, you guys should add more obstacles that are stationed on the planet! The volcano is very useful since it limits the landing space you have. As for the artistic theme, I would recommend creating multiple backgrounds that go alongside the planets. As for the planets, I would love to see the planets be round! I LOVE the look you guys are going for but the planets just look like they're low quality more than anything. You could also add a bomb that will get closer and closer to you as the timer counts down and finally attaches to you and explodes when the timer hits 0! As for game-modes, keep looking into different objective based game-modes! Such as rescuing survivors from the planets! 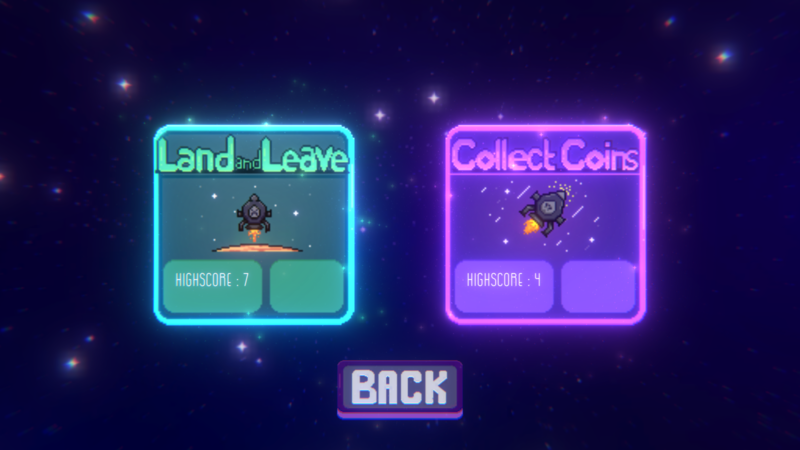 You should also consider offering a sandbox mode where you can alter the rotation speed of the planets, speed of the asteroids, and speed of the spaceship! We have heard alot of feedback on the timer from itch.io and from our testers, we are going to look into this and see with what solution we come up with. We totally understand, the game is not near to being hard, or with increasing difficulty, nor finished. As you might noticed there was a Lava planet with some obstacles on it, our artist is working hard on making the obstacles for the other planets, it's definitely not an easy task. Thanks alot, and we are in consideration on reworking the planets and actually making them round planets. 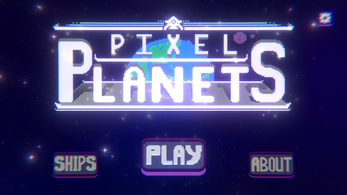 We have worked with it because we thought it fit the title of the game, but we have heard negative feedback on the pixelated planets so there might be a rework on that. As for the gamemodes, we have also thought about adding different gamemodes but thats our last concern at the moment, we are working with full focus and improving the game. All the feedback that we got right now is helping alot! We won't take your critisim too harshly, we love every single feedback , it helps to improve the game. And with this whole message of yours you helped out alot! After the count down in both "collect coins" and "land & Leave " the game is paused or at the very least waiting on a command. When I press escape the game starts. The game felt really hard until I found a system where you can just land and hop along without getting hurt. I would either make the meteors more sporadic and bounce of the planet or use them in a different way as there doesn't seem to be a difficulty curve or change up to stop the player from hopping along the planet and then leaving. I could complete each stage within four seconds. Keep in mind the game is still in beta, as of for the difficulty, we are working on making it a bit more interesting. Keep an eye out on this page. Yeah, I was just giving some feedback. I only found one bug ; I can have another look some point today to find more. I hope it turns out to be super fun. It would definitely help alot if you could find some bugs, we have a discord server: https://discord.gg/ndx8r7 , feel free to join or recommend it to other, would help the team out ALOT. What are the coins for if they don't add to the score? Or will it add to an in-game store? Why are the players collecting coins? Our intention for the coins was to have an in-game currency that you can buy let's say Ships for example, the coin itself isn't the final art we will use for the coin. Hi, I ran into a bug a few minutes into the game, it seems if you pause the game, go back to the main menu, then enter into either of the two modes, your game will be frozen and it will keep zooming into the planet until you press escape. Thank you Gav! We will look into it. The chromatic aberration effect is a little overwhelming, specifically on the top two buttons. The buttons should have a highlight effect when you mouse over in addition to the sound you have. Just to give a visual cue to the player. I'm gonna assume the "Ships" and "About" buttons do nothing at this point, which is fine. The check boxes are filled when you turn the options off, which seems backwards. As mentioned by reddit user /u/qwertygnu, the dropping is a bit slow, just a tad. Don't overdo it. Also as mentioned by the same guy, the coins do not work. The planets are a little pixelated around the edges. Other than that I think this could be a fun mobile game to play when you have a quick break. Good work! I left a bit of chromatic aberration left, it's not as heavy as it was before. 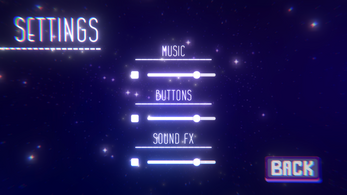 Our artist is working on the highlighted buttons, bare with us! About the timer... we will have to think about it, but thanks a lot for the mention. That's how we came on the name! It's because they have a resolution of 128x128, we could have it remade, depends on how many people would like the planet to be round. I did not realize I had a response! I totally did not even realize the planets were purposely made like that, my bad. I thought it was just a nice name with some alliteration. I appreciate the quick communication, in my experience most developers don't respond that soon (I'm a great example of that, responding 4 days later), good on you!